The Oscars may be Hollywood's biggest night, but Broadway's best came to Los Angeles to play on February 26…and win. This year was a great one for musical theater nerds everywhere, and it wasn't simply because the whimsical movie musical La La Land nabbed six awards, including Production Design, Cinematography, Best Song, Best Score, Best Director and Best Leading Actress (not Best Picture); Moonlight, written by playwright Tarrell Alvin McCraney and director Barry Jenkins, earned the coveted Best Picture prize. Viola Davis received her first Oscar for reprising her Tony-winning performance in August Wilson’s Fences; she took home the statue for Best Supporting Actress and delivered a speech that is sure to be quoted for years to come. “Viola Davis just got nominated for an Emmy for that speech,” host Jimmy Kimmel joked. 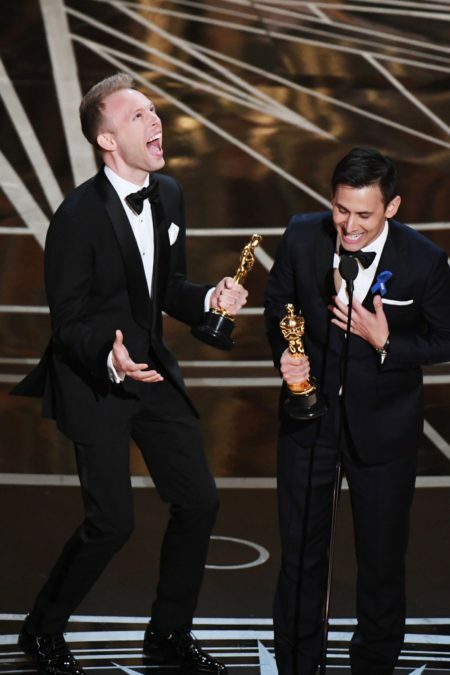 La La Land and Dear Evan Hansen music makers Benj Pasek and Justin Paul's “City of Stars” nabbed them their first Oscar. Broadway alum Emma Stone took home the award for Best Leading Actress for La La Land as well. Stage alum Mahershala Ali received the award for Best Supporting Actor for his luminous performance in Moonlight. Playwrights Tarrell Alvin McCraney (Best Adapted Screenplay) and Kenneth Lonergan (Best Screenplay) also took home awards for Moonlight and Manchester by the Sea, respectively. One of the best Broadway nods for theater nerds at this year's Oscars? During the presentation of the award for Film Editing (which went to Hacksaw Ridge), Seth Rogen and Michael J. Fox sang a snippet of “The Schuyler Sisters” from Hamilton, to the delight of Oscar nominee Lin-Manuel Miranda. We're not sure if we'll see Rogen donning King George's robes anytime soon, but what we are sure of is this: Broadway can run with Hollywood's big boys.